As Septicisle has pointed out, the Desmond papers - which have long been at the forefront of anti-Islam coverage - have jumped on President Sarkozy's comments about the burkha. 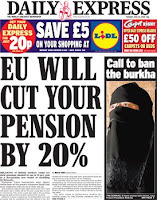 But as their front pages on 23 and 24 June shows, every story about banning the burkha they have published has been illustrated with a niqab. Inside the 24 June edition, there are photos of women in Burnley and Luton in niqabs. They also have a pic from Leeds showing three women - two appear to be in niqabs, one in a hijab. The caption reads: 'Women in burkhas in Leeds yesterday, one almost completely covered. Another shows her eyes, a third her face'. So not burkhas then.